Plans to invest £300m in the UK city of Blackpool's tourism industry, which includes the creation of new hotels, apartments and restaurants on the famous Golden Mile, have been unveiled. The first phase of the significant project, the largest for Blackpool in a century, will include a new flying theatre – thought to be the first in the UK – along with a virtual reality experience, multimedia exhibitions, an indoor family entertainment venue dubbed Adventure Land, a gaming zone and an alien-themed diner. The investment will also include a new multi-storey car park with in excess of 1,000 spaces, a food hall, a 150-room promenade hotel and an event square with a stage. Phase one is scheduled to open in 2024. Phase two will include apartments, further food and drink outlets, a second hotel comprising 250 bedrooms, with additional landscaped public open space. Future phases to the southern end of the site will include further leisure attractions, residential apartments and a music venue and nightclub. 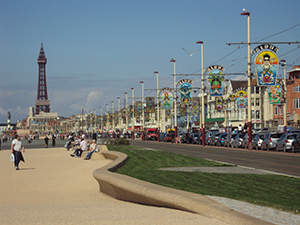 Blackpool Council leader Cllr Simon Blackburn hailed the vision as a "game changer". He said: "These new attractions are of ground-breaking international quality and their cutting edge technology will take Blackpool’s tourism offer to another level." The 17-acre development site is currently home to Blackpool's largest surface car park.